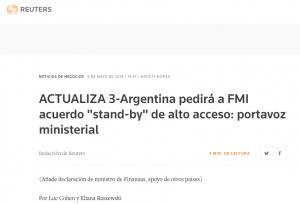 In an article originally written by Reuters and translated to Spanish for Reuters Argentina on May 10 managing director of Cefeidas Group, Juan Cruz Díaz was quoted on President Mauricio Macri’s decision to seek a credit line from the International Monetary Fund. This article was also republished in América Economía, in Infobae and in Cadena Sol. To read the full article, please click here or here or here or here.